The purpose of any eye examination is to help the doctor find the underlying problem causing vision or eye complications. Basically, the doctor observes the behavior of troublesome eyes and tries to relate these with certain physical symptoms. Then, he/she conducts numerous tests and, based on the results, gives his/her diagnosis, starting the treatment. One of possible tests involved in diagnosis of an eye disease is refraction. This test is used for diagnosing conditions such as nearsightedness, farsightedness, astigmatism, presbyopia and others. Here, the clarity of one’s vision at a distance of 20 feet is assessed. The results are established through Snellen chart, being a device used for assessing the visual acuity of an individual. This is, basically, a chart with glowing letters, placed in rows and in specific orders. The letters are to be read from proper distance while the device takes care of automated refraction, emitting special light into the eye. Next, one’s visual field gets tested. This test focuses on the whole range of one’s vision, including the periphery vision and central vision, testing each eye separately. Visual field testing is very useful for diagnosis the reasons behind specific problems like, for example, proneness to bumping into objects which are located on a specific side of the body etc. The test is either performed manually or by devices such as Amsler grid or Goldmann perimeter. For some other specific eye problems, ophthalmolscopy is necessary. This test is done with a device called ophthamoscope, which looks like a hand-held flashlight onto which magnifying lenses are mounted. The doctor takes the device and releases a beam of light straight into the eye of the patient. Then, the health expert observes the characteristics of different eye parts. Sometimes, for better visibility of the inside of the eye the doctor dilates the patient’s pupils by using special eye drops. These drops have several adverse effects, some of which are blurred vision and photosensitivity. However, these disappear after a couple of hours. 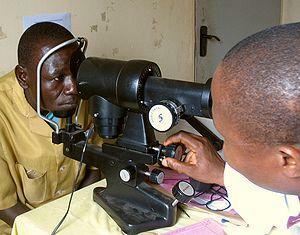 Ophthalmology is the most common eye test, being performed during each routine health check. Speaking of eyes and the reception of light, electroretinography is a test used for assessing the health of one’s photoreceptors in the eyes. This test is performed by placing a device resembling a contact lens onto the surface of the eye and an additional electrode on the cheek of the patient. Then, in dark environment, the eye is exposed to different levels of light and the reactions are recorded for diagnostic purposes. Finally, lately, computed tomography and MRI tests are done, giving the doctor a detailed image of the inside of one’s eye, allowing him/her to seek and possibly find any foreign objects in the eye tissue.